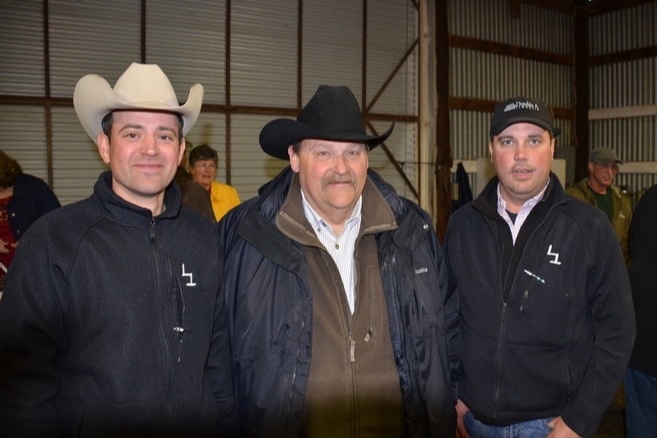 We appreciate all our customers, neighbors and friends that contributed to a successful 2019 Production Sale! One family. Committed Program. Built from the ground up. For 40+ years the L7 Bar Limousin brand has stayed in business producing Limousin cattle that deliver efficiency, moderation, and sustainability. These same words, new buzz words in our industry, are tradition in our program. We think cows that save their calf in the storm; bulls working in hot, dry conditions; the feedlot cattle that have the most efficient feed conversion and the highest yield-grade and dressing percentage. are a few of the cornerstone qualities of the Limousin breed has offered over the years and are still relevant today. We've seen fads come and go. But our commitment to deliver bulls and heifers that meet your cattle operations needs has never waivered. With we've been around for almost 50 years, consistently delivering quality limousin cattle. With that sort of history, it's a given Peterson's L7 Bar will be here for many years to come. One Family, committed program, built from the ground up. At Peterson’s L7 Bar Limousin we are a family operation, comitted to Limousin cattle. If you have questions about our operation and cattle, feel free to talk to Rod or Cade, we love to talk cattle. For almost 50 years, the L7 Bar Limousin brand has produced heavy-muscled, high-performance, stout-made, deep-ribbed bulls and females. Even today, our family has stuck to our commitment to breed Limousin that pack on pounds to calf crops because we believe in helping our customers achieve a profit-oriented product. When shopping for your next bulls or females, come to Peterson's L7 Bar. Our priority is to keep our customers happy. That's why all L7 Bar Limousin cattle are fully Guaranteed. If you're not satisfied let us know! Buy with confidence from Peterson’s L7 Bar Limousin, our cattle are fully Guaranteed. The buzz words of the cattle industry are the very things that have kept Peterson’s L7 Bar Limousin in business for the last 45 years. We think about the cows that calf in a storm and still saves the calf, the bulls out working in hot, dry conditions, the feedlot cattle in muddy lots that have the most efficient feed conversion and the highest yield-grade and dressing percentage. These are the very things that have kept the Limousin breed here for 50 years and are still the most needed in the industry. The cattle we raise at Peterson’s L7 Bar are real world tested and proven,. The proof is that we are still here. Let’s talk cattle. Drop us a note, so we can connect and talk about how our cattle genetics might be a fit for your operation.